BenWard: The experience of liking things and following things happens in the walled garden of Tumblr. One of the intentions of web intents is that you take a tweet and it still displays the actions underneath - someone that is a twitter user can take those actions out of that webpage and interact with that piece of content in the system. Tantek's canonical copy could, if displayed in his web page, display the actions that have occurred on that tweet. This could occur for any content if the appropriate intents and interfaces are provided. What should hosted content systems provide in terms of identifying endpoints of users to enable web publishers to hook into that content from their website. Such that the canonical copy of that piece of content can still be the most useful interactive place. If I find a tweet on Tentek's site, I want to be able to operate the same verbs to (my home base) where it is Tumblr, Twitter, Status.net. Amber: In Chris Messina's case, he sketched a tweet of mine and flickered it, and it was tumbled later by the CEO of blip TV, and then twittered back to twitter. The object became social. Tantek: Based on your question about Twitter's web intents, here is an example. Kenneth Cole tweeted this link on KennethCole and it was syndicated to KC's window on their corporate headquarters. Because of this UI you can clearly this is a Twitter post -- it is the Twitter UI. Amber: These elements, when included, make you feel as if you're on Twitter. Tantek: Now that Twitter has given us the ability to create intents anywhere -- then my question is when do we get to the uncanny valley of Twitterness? Aaronpk: I would say that Facebook does that already - freaking Facebook! 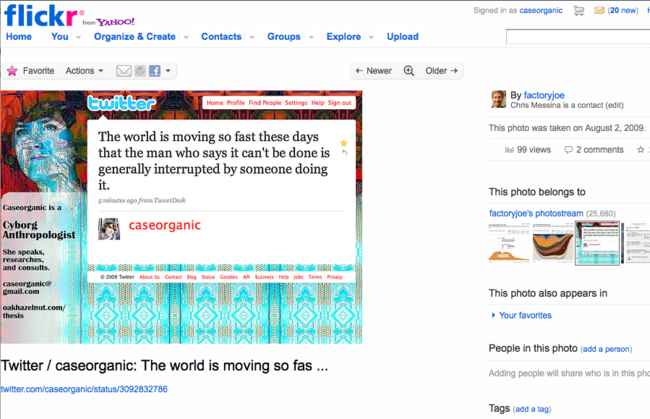 When I'm on TechCrunch I keep feeling like, "What, am I on Facebook?" when I look at the comments. Tantek: Has anyone done this on their own site with web intents? Having the extra functionality below a piece of content. Amber: For instance that functionality should be carried over to every piece of content based on where it was originally placed. BenWard: Those embedded quote still retain the actions. BenWard: Likewise if you were also able to provide intents for Tumblr, then those could be placed on the site. Tantek: Yes, reblog is generic because it's not tied to Tumblr. But for now I'll just hardcode it to Twitter because that works. Amber: This calls to what ChrisMessina was talking about this morning in terms of multiple verbs that mean the same thing. Skinny: Or it detects what you're logged into. Amber: And it presents you with the intents based on what you're logged into. Tantek: But we fixed that bug in Firefox so it's no longer allowed. WillNorris: This is why you need identity in the browser. Shane: It's a Nascar functionality. The Nascar effect is Login with Facebook, Login with OpenID, blah, blah, blah. Share this with x, y, z. Nascar's are just covered in logos. Amber: There's another share button. It is an object modifier. One way that it solves it is to "Show me all verbs available on this object." And then you never have to hardcode anything into your site. You let the external site the user is logged into take care of it. Aaron: Exactly - that's just how Android intents work. BenWard: One of the consequences of this login, the Twitter-specific actions are relevant to me, and this the Twitter actions can be showed. This page was last edited on 24 April 2019, at 12:21.